We are proud of the awards & recognition we've received over the years. Thank you to our clients and those in our industry who nominated, voted & made this recognition possible. NAPA Top Women Advisors are nominated and voted on by industry peers and selected by a NAPA panel of judges based on information about their practice, experience and accomplishments as provided by nominees. 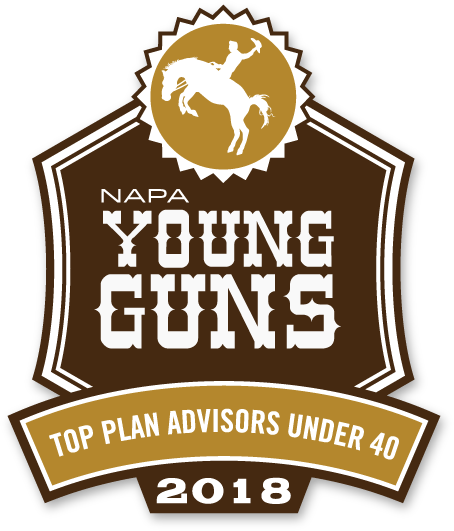 NAPA Young Guns awardees are nominated and voted on by industry peers and selected by a NAPA member committee based on business profile and future industry leadership potential. Financial Times Top 401 Retirement Plan Advisors awarded to financial advisors advising at least $50 million in defined contribution (DC) plan assets where DC plans represent at least 20% of total AUM. This is graded on several criteria, including growth in DC plans and assets, plan participation rates, experience and industry certifications, and compliance record.